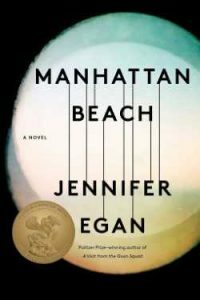 Summer reading is around the corner and we’ve got your next pick for book club: Manhattan Beach by Jennifer Egan (Scribner), which won the 2018 Andrew Carnegie Medal for Excellence in Fiction. It’s not always easy to get a good conversation going about a book. Good discussion questions are open ended and allow for readers to share their own feelings and opinions; that’s why we’ve got a Manhattan Beach discussion guide ready for you to lead your next book club with confidence. Developed by the Andrew Carnegie Medals selection committee, which is comprised of readers’ advisory experts that work closely with adult readers, this guide asks questions that will immerse you and your group in a thoughtful, engaging conversation. Not part of a book club? No problem, we’ve got you covered with resources on how to get started.